Why use separate validation tools to check your web pages when you only need one? 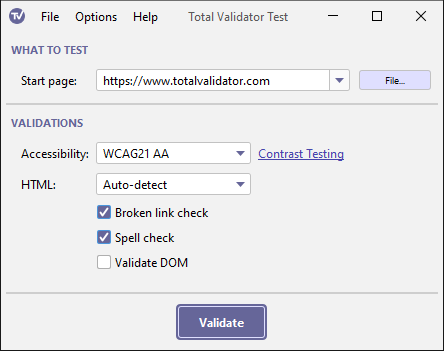 Total Validator performs the 5 most important validations on your web pages: HTML and CSS validation against published W3C specifications; accessibility validation against the WCAG and US Section 508 guidelines; spell checking using one of five languages; and testing for broken links. Note that this Test version performs Accessibility and HTML validations and only outputs a summary. Get the Basic or Pro versions for CSS, spelling and link checking and to see the detailed results. Why these 5 validations ... Search engine robots/spiders are very fussy and will not search or index some or all of a site if they come across invalid HTML. So if you want to be properly listed you need to be sure your HTML is valid. Just because you can use your website doesn't mean that someone with a disability can. You should ensure your sites conform to the W3C WCAG Accessibility Guidelines, (and that also means strictly W3C validated HTML), or US Section 508 standard, if you want your site to be accessible to all. Spelling is often left unchecked and will make your site look and feel unprofessional and even unusable. Broken links are the bane of every webmaster, you may get your internal links correct, but external sites tend to change all the time, and there's nothing that makes your site look worse than a link to nowhere. So you need to regularly check your site for broken links. Note that this Test version only validates Accessibility and HTML and is designed so you can see if you have a lot of issues and decide whether or not to upgrade to the Basic or Pro versions for more validations, and to identify where the issues are to help fix them. TOTAL VALIDATOR TEST LICENCE AGREEMENT IMPORTANT - READ CAREFULLY: This Licence Agreement is a legal agreement between you ("You"), where You are either an individual person or a single legal entity, and the Author (Total Validator) for the enclosed software and any associated documentation (the "Software").